For someone trying to grow more of their own food – there may be no better choice to add to the garden plan than potatoes. They can be used at breakfast time, lunch time or dinner – and they can store well too – making them a great staple crop! 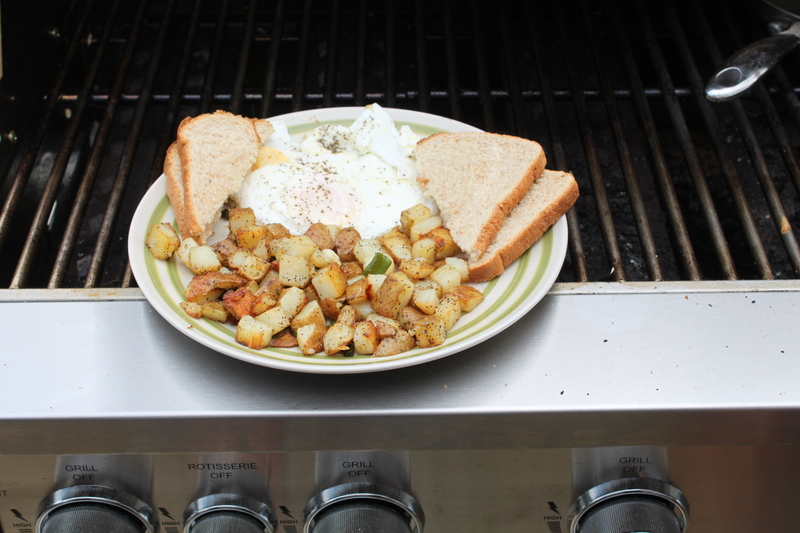 Potatoes can be used at every meal – one of our favorites is at breakfast! Home grown potatoes are not only easy to grow – their taste is far superior to anything that can be purchased in the grocery store. Potatoes as a commercial crop tend to be highly sprayed and have been bred for storage and shipping ability – not for taste. In reality – there are hundreds of varieties in all shapes, sizes and colors that burst with flavor – just waiting to be grown in your garden. There are still the staple Yukon Gold and Red Potatoes available for the home gardener. They do indeed taste much better than store-bought types when grown in the home garden – not to mention you can keep them from having sprays applied. But some of the lesser known and delicious types like Chieften (red), All Blue (blue), Banana (yellow fingerling) and Purple Majesty (purple) are as fun to grow as they are to eat – and are among our favorites. Although there are some varieties of potatoes that can actually be grown from seed – the best possible way for the home gardener to grow their own is from seed potatoes – which are nothing more that the potato itself – either small ones – or larger sizes cut up to have at least a few “eyes” on each piece. They eyes are nothing more than the little spots where tubers develop on those “I left them in the pantry too long” potatoes. You will want to cut them about two days before you are ready to plant – this allows them time to form a protective layer around the cut and holds in moisture. Potatoes pulled from our garden that have grown from a cut potato seed. Plant potatoes in the cooler weather of spring. There is a lot of debate on when to plant. Here in Ohio, we like to plant ours in late April – a few weeks before our last normal frost date. Some will tell you after – some will say before – but you know gardeners :). The reality is – they both work – just depends on the weather! Potatoes are well suited to rows or raised bed planting. You will want to dig a 3 to 5” trench – and then plant your potatoes 10 to 12” apart in the trench – making sure the eyes of the potato are facing up. They really prefer loose soil – so if your soil is hard and clay-like – add a bit of sand and compost to the soil when planting. Cover up the potatoes with the dirt. Over the next few weeks – you can add a layer of dirt and even straw over the crop as they begin to grow – making sure to keep the tubers underground and out of the direct sunlight. This process of adding soil is often called hilling. Keep your crop watered well – making sure the area gets a good inch of either rainfall or watering a week. 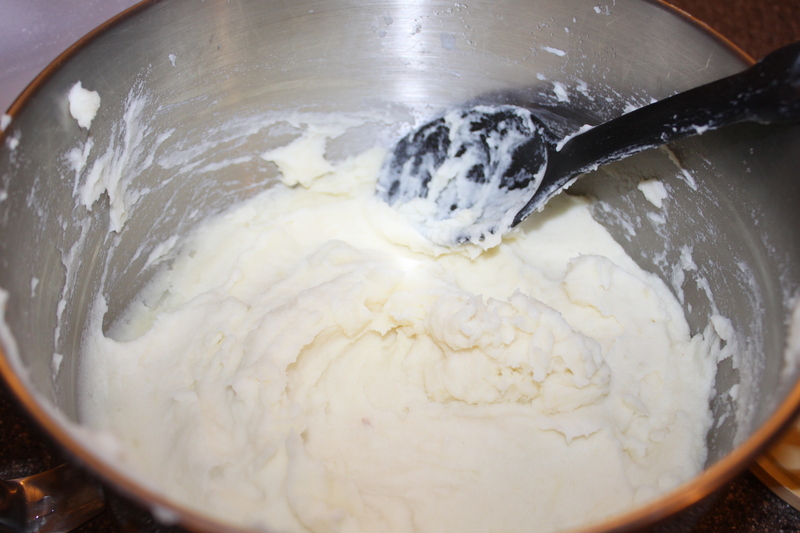 Light and Fluffy Mashed Potatoes – Ready To Serve – another great use for those potatoes in storage! Always dig up your potatoes after you have had a few days of dry weather – harvesting when wet makes for all kinds of problems with storage and getting them to come out easily. We use a pitchfork and gently raise the soil from the edges to avoid damaging the crop. Only brush off the dirt to clean them – do not wash – as it will lead to them decaying in storage. Store them in a cool, dark place. 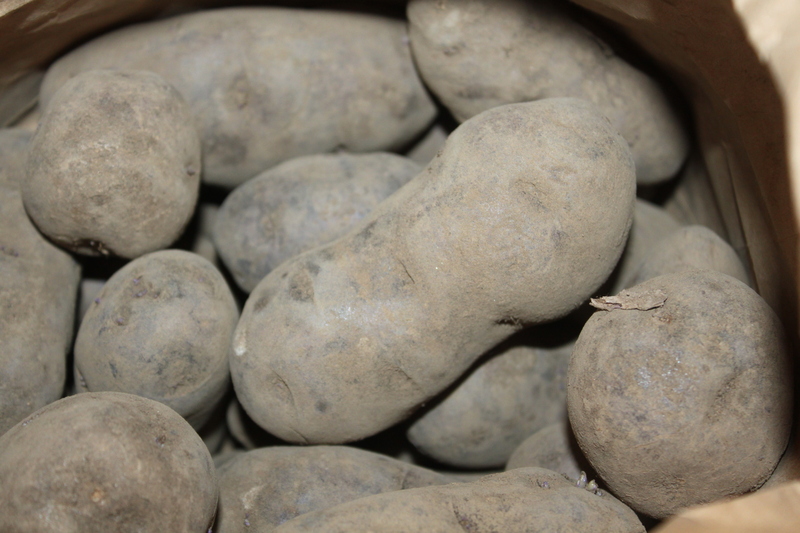 Harvest time is also a great time to select you seed potatoes for next year. Hold back and store smaller ones to keep as planting stock – along with some nice medium-sized potatoes that have a lot of eyes. Only select firm and blemish free stock to keep them from rotting. Store these in the coolest, darkest place you can find. 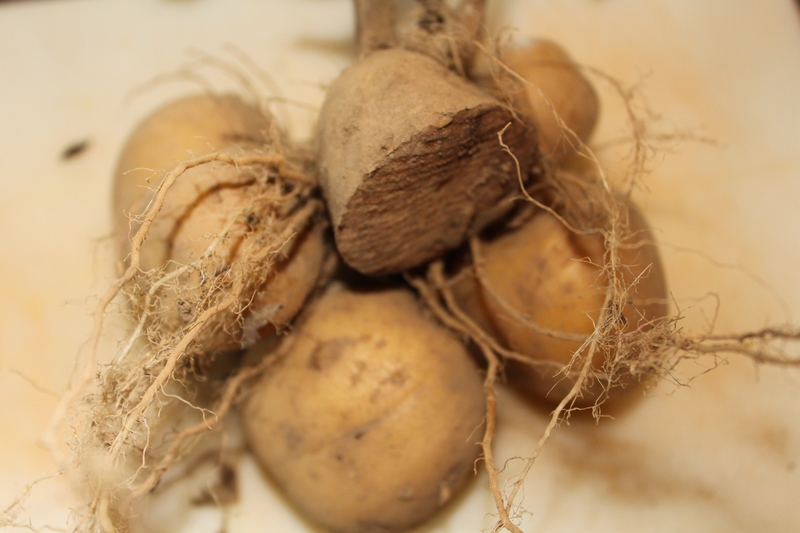 A good rule of thumb for yields when planting and harvesting : 1 pound of potato seed stock will usually yield about 8 to 10 pounds of potatoes. One of the best ways to keep disease and pests problems away from your potato crops is to rotate where you plant it from year to year. 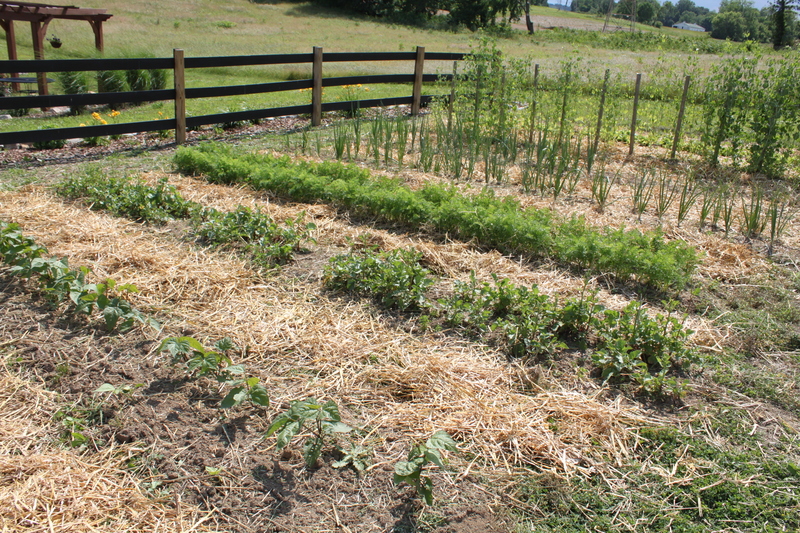 In addition, when planting – never follow tomatoes with potatoes or vice-versa. They are from the same nightshade family, use similar resources from the soil, and both can be affected by the same blight that can be passed on through the soil. Potatoes do well when planted around or with onions, beans, corn, cabbage or carrots. It is best to keep them away from cucumbers, pumpkins and squash. So make sure to add potatoes to your garden plan this year!